While I do not follow any diets for weight loss (I follow a gluten-free, low fodmap due to celiac and IBS) and I am a self proclaimed lover of carbs, you may occasionally find recipes that fit several of the main stream diets on The Creative RD. This recipe for example is often thought of to be a “low carb” “paleo” recipe, but I add this on top of a complex carbohydrate like brown rice. I (and science) do not believe that carbs are the enemy, but I do understand that they are often over consumed. For example, I was often the person who could put a layer of rice covering my whole plate (and I mean a GOOD amount) and then top it with whatever else was being served (like I said, I’m a carb lover), but I’ve learned that having a proper portion size of it satisfies me just fine. So now I have about 1/2 cup of rice (quinoa, millet, sorghum, buckwheat, etc.) and load up on veggies and add some protein in there as well. I’m all about a balanced plate…and yes, carbs are part of that! You can however choose to not serve this over rice, but I promise it’s delicious. 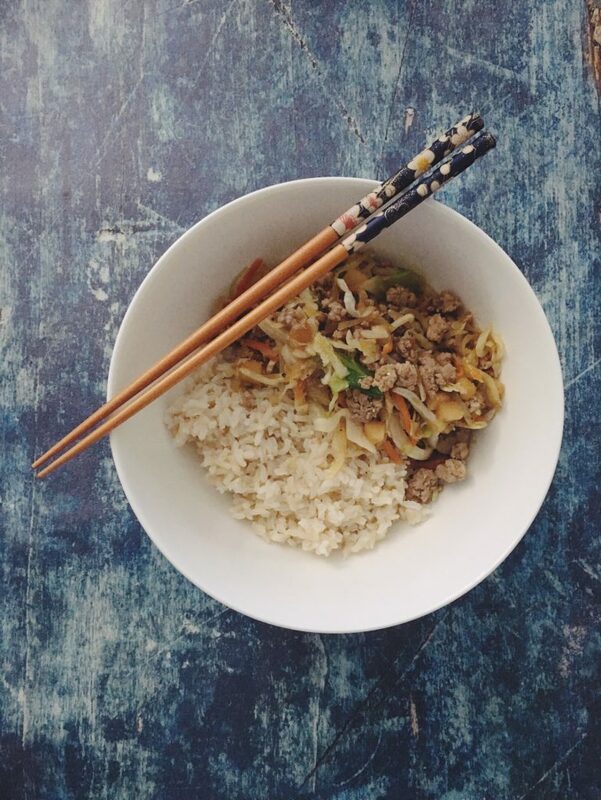 The Egg Roll In a Bowl has become a staple in our house! I’ve made it with ground turkey, chicken, pork, and even crumbled tofu. This is easily adaptable to be non-gluten free simply by subbing out the tamari for regular soy sauce. Have to avoid soy as well? simply sub out coconut amino acids for the soy sauce or tamari. As with most of our Asian inspired dinners; we serve up a side of sliced cucumbers with a drizzle of sesame oil and sesame seeds on top (again optional), for that refreshing crunch! 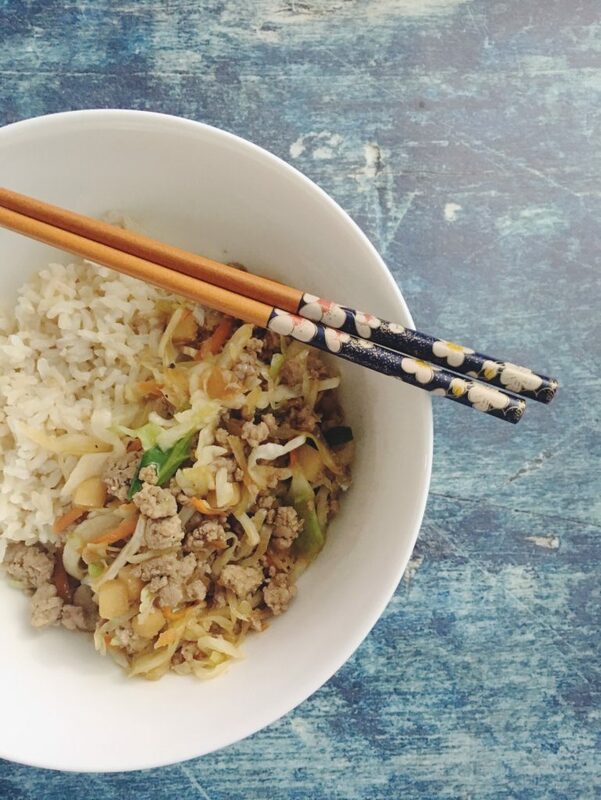 To watch the sodium content of this meal and all our other Asian inspired dishes, I use the San-J 50% less sodium gluten-free tamari sauce – the flavor is incredible and 490 mg per tablespoon vs the typical 980 mg for regular and 720 mg for reduced sodium.